Agape Spain News: "Link" was a blessing! I I want to do it again! More than 2 weeks ago the Zero File was in Cordoba, distributing publicity about the Zero File contest in grammar schools and high schools and also promoting the internet comic series at 2 different shopping malls. Zero File is not just an internet comic series. Not only is it a great tool to help young people discover Jesus, but it´s also a way to help young people in the churches evaluate their relationships with others, with themselves and with God. "Hello everyone! "Link" seemed to me to be very edifying. Why? Because it made each one of us that was present open our hearts, and for me who has known everyone there for a long time, I listened to them share personal things from their lives that I´d never heard before and that I had no idea about. This helped me to open up my heart too. We all felt very comfortable and, personally, I didn´t want the activity to end. In terms of the two games that they did, we were all very entertained and we were able to take away something from each game, like what unity looks like among us, if we are really trusting the people in our group, knowing that we should listen to each other and pay attention, etc. 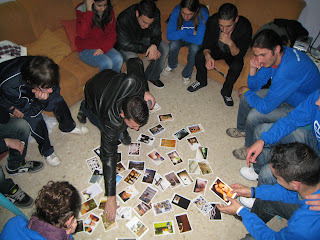 Pictured in the photo above is the youth group during one of the LINK games.